My favourite vegetable is the humble tomato; I love to grow them but love eating them even more in a salad, cooked in a stir fry even on toast. Vegetables are easy to grow if you follow the easy steps. 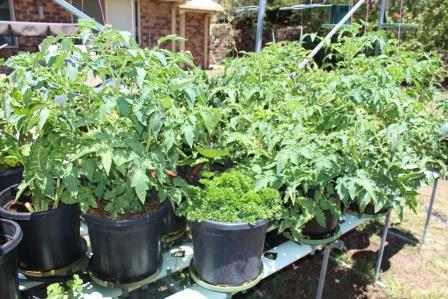 I grow all my vegetables in full sun, but the problem with growing in containers is the problem of evaporation the soil in the pot will quickly dry out, so you need to check your plants every day to make sure they have enough moisture. You can retain more moisture inside your pot by adding more organic matter and worm castings than you would normally use in a garden soil, by adding more worm castings and organic matter it absorbs the moisture and retains it longer for the plant to utilize when required. I also paint my pots white as this reflects the heat from the sun; the black pots absorb the heat from the sun over heating the soil and evaporating the contained moisture. I build lots of organic vegetable gardens and I never purchase garden soil it’s a waste of time and money, I normally rebuild the soil the customer has, and also love Lasagna gardens they are my first choice and you can normally find the materials for free. So please google lasagna garden or no dig garden if you’re stuck or want advice contact me via the website www.wormtec.com.au and I will point you in the right direction. I use mushroom compost and horse manure, My wife is a rose growing nut and has all her precious roses in plastic pots, she uses a mix of 40% mushroom compost, 40% horse manure, 15% worm castings and 5% fine rock dust for her mix. I have used this same mix in my vegetable pots with fantastic disease free results, If you have good soil you can mix it into this mix at a 50% ratio. The bigger the pot the better it is, not so much for the root system, but most vegetables are very hungry and need lots of nutrients and moisture with a larger pot your soil can hold more water. Here is another very important area of growing in pots, you only water enough so the soil is wet you don’t want lots of water running out the bottom of the pot as this washes all the nutrients out of your soil, you also don’t want the soil to dry out as the soil will shrink in the pot and the water you add will run down the gap between the soil and the pot side not even watering the soil at all. Retaining Nutrients and Minerals in your pots. Because you have mixed a nice organic soil full of organic matter containing all the nutrients your plants require, there is an extra step you can utilize to conserve you water and nutrients inside your pots, Soil Biology is the answer soil microbes go around in the soil consuming the minerals and nutrients contained in the soil, these microbes then contain the minerals and nutrients inside their bodies so if you water heavily the microbes are live animals and cling onto the soil particles and don’t wash out of the pot like a nutrient would, when these microbes die or are consumed the release these nutrients like a slow release fertiliser would, microbes also live on the soil particles and coat each soil particle with a mucus coating, this coating retains moisture. Applying a thin layer of mulch will reduce your water evaporation as well try using a little Lucerne hay its full of microbes that produce nitrogen, it works great for me.